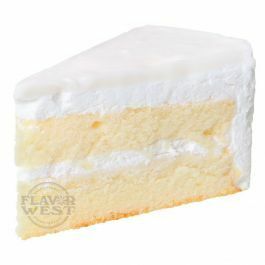 White Cake flavor taste wonderful in your treats; it offers a rich flavor taste of vanilla. Regardless of what you use, the rich aroma and taste make your favorite baked treats come to light. Type: Cake-White Water Soluble Flavoring. Ingredients: Natural and Artificial Flavoring, Ethanol and Propylene Glycol. USP Kosher Grade Flavoring. Usage Rate: 15-20% for E-use. Flavor suitability: Desserts, pastries and baked treats, yogurt, ice cream, candy and more. Specific Gravity: 1.05 No Refunds on Flavoring. Using at the recommend 15% is great on its own. If using in a complex mix then I would advise 5%. If you have ever made white cake and tasted the cake before baking it then you will understand this flavor. Pairs well with strawberry and other fruits that you would consider cake worthy. This is a Gem that should be in your e-juice recipe flavors.